Russia's "SolidPenis"establishes a new streaming record by winning €250K in a PokerStars France Spin & Go! PokerStars France offers three-max, hyper-turbo, lottery-style Spin & Go's at a variety of buy-in levels ranging from €1 to €100 where players can win up to 10,000-times their buy-in. Players from around the world can play on PokerStars France, provided that they are not in a restricted country and have a European bank account. 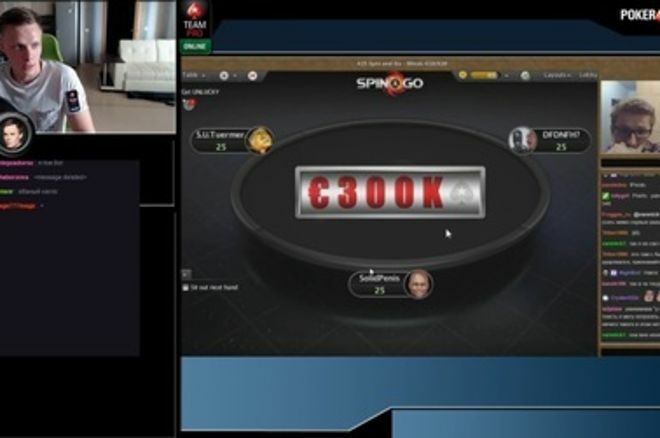 According to the PokerStars Blog, a Russian player with the charismatic screenname "SolidPenis" recently won a life-changing sum of €250,000 in a €25 Spin & Go on July 22 while streaming live on his aKTepnopHo Twitch account. Since the stream was in Russian, PokerStars Team Online Pro Mikhail “innerpsy’ Shalamov took it upon himself to narrate in English in a 12-minute video the entire experience. The odds are very steep to play in the highest prize pool in Spin & Go's on PokerStars France. At the €25 buy-in level, just one in 250,000 games launch off with a €300,000 prize pool which awards €250,000 to the winner and €25,000 to both second and third place finishers. The reactions by "SolidPenis" during the stream were just as many would react if they were playing the top prize. At first, it appears he was in shock sharing with his viewers, "It can’t happen. It’s not happening for real?" The Russian player makes some folds that Shalamov admits are uncommon in Spin & Go's for lower prizes including when he folded a straight when he was raised all-in by his low-stacked opponent who possibly nailed a flush when a third diamond spiked the river. Just before the final hand is dealt, Shalamov shares, "That is just a solid performance from 'SolidPenis'." Shortly thereafter, his opponent "DFDNFH?" shoves all-in for approximately 10 big blinds which "SolidPenis" calls with with about 27 big blinds. "DFDNFH?" turns over making him an almost 70 percent favorite to win the hand. When the flop came out , the odds for "SolidPenis" to win the hand went down to about 20 percent although he gained two outs with the or on the turn or river giving him a straight. That is exactly what happened on the turn when the appeared on the turn giving "SolidPenis" a straight and transforming his hand from a huge underdog into a more than 77 percent favorite to win the hand. "SolidPenis" was able to avoid any of the cards that would give his opponent a full-house when the harmless spiked the river and awarding him the top prize of €250,000. His reaction on the win is just priceless as he is in complete shock. "SolidPenis" shares with his Twitch viewers that, "I have no words," before also stating, "What important thing can I say at this moment? Be kind to everyone, believe in love, and I won’t say I deserved it or didn’t deserve it." The €250,000 or almost $278,000 that "SolidPenis" hauled in for his victory, marks a new record for the amount won in online poker while streaming. The previous record was set a few months ago when American poker refugee Doug "WCG|Rider" Polk shipped the Mountain Series — $700 Kilimanjaro, NL Hold'em, $750K Gtd for a huge haul of $162,952 while streaming live on Twitch. Players must get really lucky to play for the top prizes Spin & Go's offer. Most of the time, players will be playing for just the minimum 2-times the buy-in in a winner-takes-all format. With this in mind, PokerStars France is hosting a promotion aptly named Get Unlucky, where players are awarded Spin & Go tickets just for playing for the minimum prize pool these games offer. Players must opt into a daily challenge, then play in an unlucky 13 Spin & Go's with the minimum prize awarded within a period of 24 hours to receive a free ticket to a Spin & Go with the same buy-in. Lead image courtesy of the PokerStars Blog.